Experiential research on the phenomenon of hospitalisation is a well-established field of study. This article argues that family members of people who have been hospitalised and have diagnoses of learning disabilities and mental health disorders are under-represented in this area of research. There is a wide range of literature to suggest that family members of people with this dual diagnosis experience unique responsibilities, challenges and difficulties due to the nature of their caregiving. It is therefore important to explore how these people - who often dedicate much of their life to caring for their relative - experience the hospitalisation of their family member and the subsequent loss of responsibility for 24-hour care. 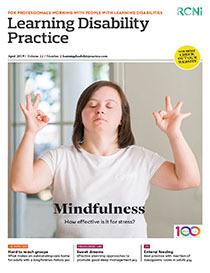 This article explores the research in this area and gives practical recommendations for improving professional practice.